Is ET out there? Can he really phone home? Whether or not extraterrestrial life exists is a question of immense popular interest. But it's not just a fun topic for moviegoers. It's a scientific issue of profound importance. 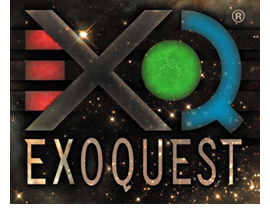 The ExoQuest® CD-ROM uses this question as a framework for integrating astrobiology research into curriculum by investigating topics based on past, present, and future NASA missions to destinations in the solar system and beyond. At each destination students conduct hands-on and simulated experiments that provide an interdisciplinary approach to science and the scientific method. Contact us to visit Exoquest.